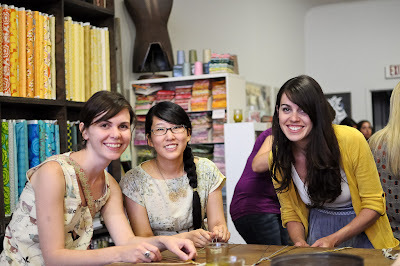 Congrats Sarah (who by the way is a quilting machine - seriously, check out her blog!) - please email me with your address so that FQS can send you out your bundle!! So, um, right, the news... well, if you "like" my page on Facebook or follow me on Twitter you may have already heard but for those of you that don't (or who missed the update), I am happy to report that I did in fact get the job that I interviewed for last week! Can I get a "woot woot" from my peeps?! I will be working as a Media Librarian at the CBC (Canada's national public broadcaster) and am starting in mid-October. It is going to be very cool and will involve your everyday-librarian-like activities such as cataloguing but I will also get to help out with research too. I am very excited and can not wait to start! 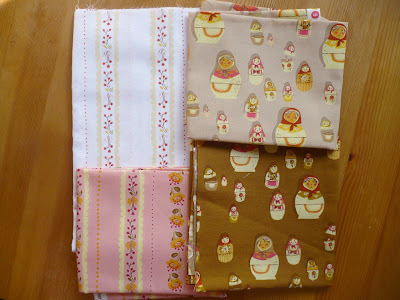 Alrighty peeps, I gotta go and get some sewing done! I am brimming over with ideas right now! Hey all, what's up?! Yesterday was the first Saturday that I've not had to go to work in two years (except for the occasional family event, etc) and it was great! I'll no longer be working on Saturdays (at least not at my present job) which should be both fun and interesting; I also have a job interview tomorrow for a full-time position so wish me luck! In honour of having Saturdays off Alex and I headed to the St. Lawrence Market and got some meat, cheese, and fresh produce - yum! I've got both yellow and green zucchini waiting for me and I'm thinking I'll make some more spiced zucchini bread. We're also planning on heading to St. Jacobs to check out the market, antiques, and maybe I'll find some Mennonite quilts too! We'll also be going to the Shaw Festival (probably the first weekend in October) to check out some plays and to hopefully see some beautiful fall colours in Niagara-On-the-Lake. Now doesn't NOT working on Saturdays sound awesome?! Yes, I think it does! Today I spent the day watching old episodes of Ancestors in the Attic and hand piecing a new project (which I will be sharing very soon)! I thought I'd post this picture because there are never any pictures of me from crafty events (since I'm always taking pictures). This is Katherine, Melody, and I at the friendship bracelet party that Karyn hosted at The Workroom in honour of Lizzy's visit to Toronto (I blogged about it here). Doesn't Karyn take lovely photographs? She has a super-spiffy camera but trust me - that girl is all kinds of talented! I kinda want to be Karyn when I grow up...does that sound weird? I'll add the rest of the fabric over the next couple of days to a week! 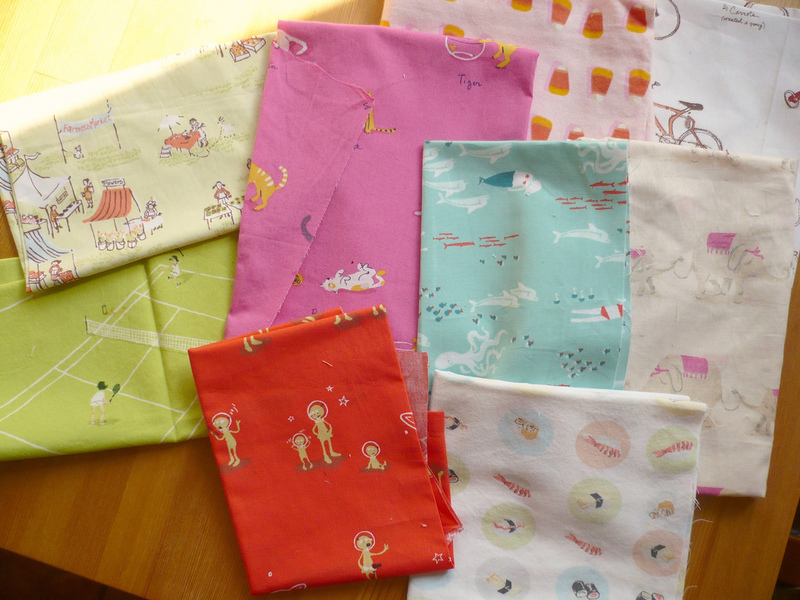 If you purchase something and mention in your "note to seller" that you found the destash through my blog I'll throw a couple of extra fabric-type goodies into your package! 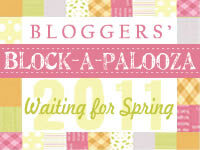 Remember back in February when I was one of the designers for the Bloggers Block-a-Palooza Quilt Along? Well, I'll be doing it again but this time it's Quilt Uber-Fest organized by the super-talented Scott of Blue Nickel Studios! Y'all know I love Fall right? It is my favourite season and this quilt along is not only taking place in my favourite season, it is also taking place in my favourite month - October! Not only is my birthday in October, we've also got Thanksgiving (Canadian, of course! ), Halloween, temperatures chilly enough for layers and chunky knit accessories, gorgeous colours, apple cider everywhere, and pumpkin everything (Pumpkin Spice Lattes anyone?) 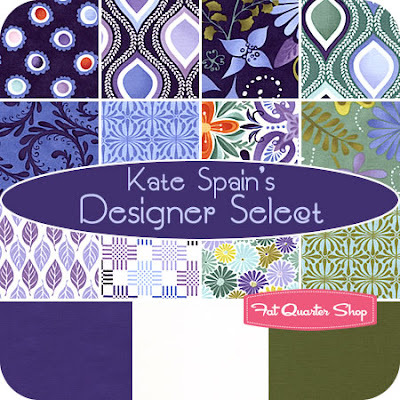 - really, it's just the perfect time for quilting! 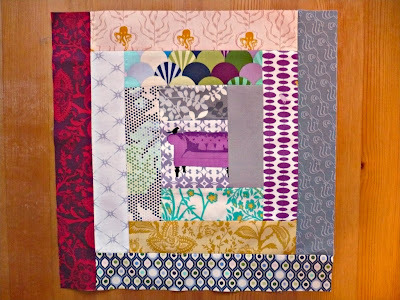 There are sixteen of us taking part in the quilt along running from October 1st to October 16th (i.e. 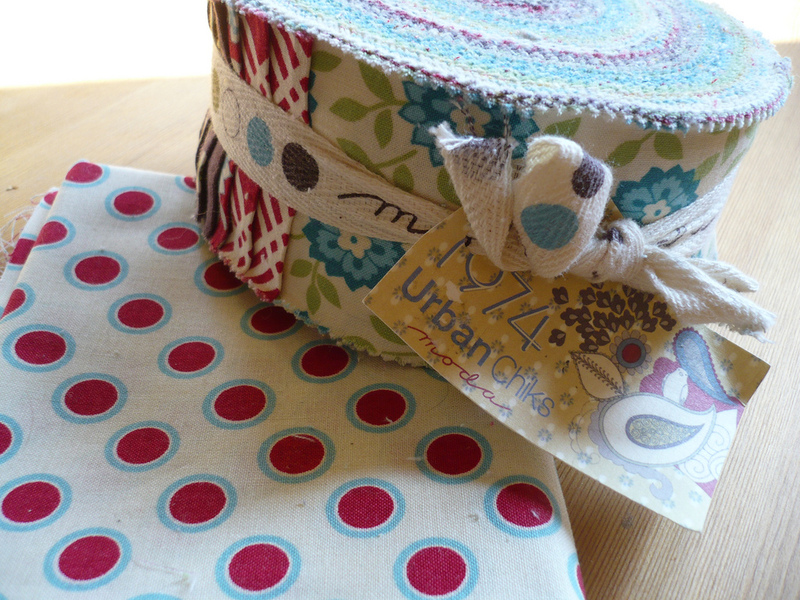 one block a day for 16 days); we'll be using the not-yet-released-collection Sleeping Beauty by Nel Whatmore for Free Spirit (you can see some of the prints in this post from True Up) and some Kaffe Fasset woven stripes and shot cottons. Each designer is also allowed to add one print or solid from their own stash if they wish. 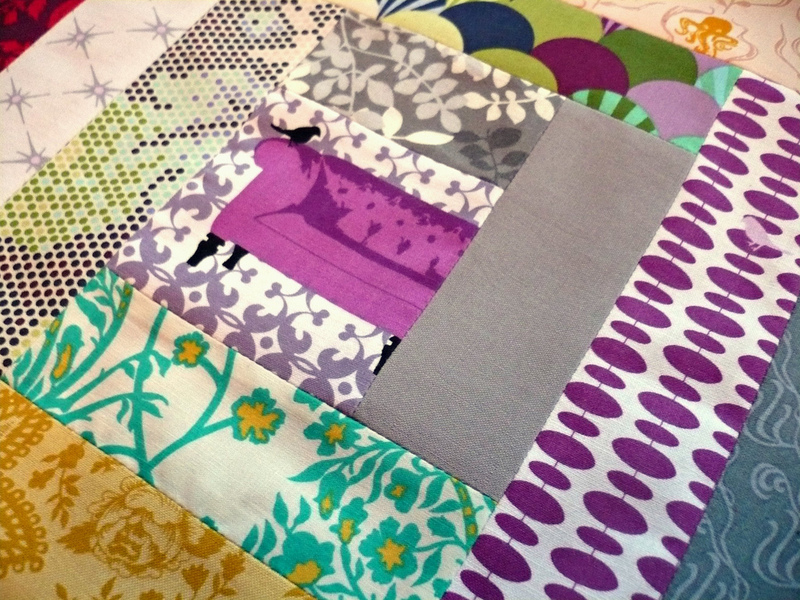 At the end there will be an auction for the finished quilt (made from our tutorial blocks) for charity - we'll keep y'all updated on that! Oct 2 Kaye Prince <--- That would be me! Oct 10 Amanda Jennings <--- This would be Thanksgiving... if you feel like eating along with us. Hope to see y'all playing along with us! Oh, and there will be a Flickr group for sharing blocks and such once the time draws closer!